Fresh from successful shows in Chennai and Pondicherry, director Siddanth Sundar brings device theatre to Bangalore with the play Odyssey. 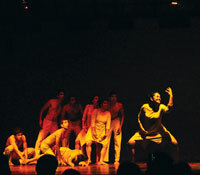 A technique that involves the cast collaboratively devising the script and form of the play, it leaves room for refinement over time as well as on-the-spot improvisation. Gruelling for the cast, who have to be fully a�?physically and emotionally presenta��, Sundara��s Lights Off Production group have been training for the performance with yoga, kalaripayattu and belly dancing classes as well as silence and touch therapy. First introduced to device theatre as an actor over a year ago, Sundar is an ardent proponent of the form. a�?As soon as I found out about it, I was fascinated. And since then, Ia��ve wanted to explore it more fully myself.a�? The first task was to bring together a group of people who could help shape the direction that the play would take. a�?I held a workshop here, and of 14 participants, nine stepped forward to take the project further,a�? explains Sundar. a�?They chose me more than I chose them. The role of the director in a play like this is more like that of a watchman,a�? he elaborates. With the idea of a�?spacea�� as their only guidance, a story began to emerge. The group decided to go back to the original Big Bang theory. 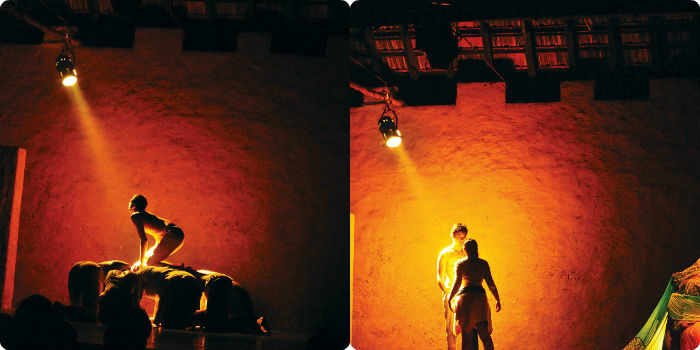 While the first section of the play propels us from the Big Bang through to the selfie era in less than 20 minutes, the subsequent two sections explore spaces created by feelings a�� loneliness, love, lust and frustration, and what Sundar describes as a�?the ultimate spacea�� a�� a mothera��s womb. In a play with such a whimsical take on space, the actual setting takes on crucial importance, and the troupe has selected venues a�?with an atmosphere and feelinga�� that they can relate to, zeroing in on the RBANMS Kala Heritage Auditorium here. To build a rapport with the audience, the cast uses movement theatre, with dance and music taking on pivotal roles. Much of the meaning is conveyed through body language, and verbal communication plays a secondary role. conveys to the audience,a�? says the director.